If you practice watercoloring a lot (and you should! ), you may have a lot of poor or so-so paintings hanging around. Not worthy of framing, or gifting…but you just can’t part with all that paper. What to do? Make something out of it! Watch the video below or click HERE to see it in HD on YouTube. 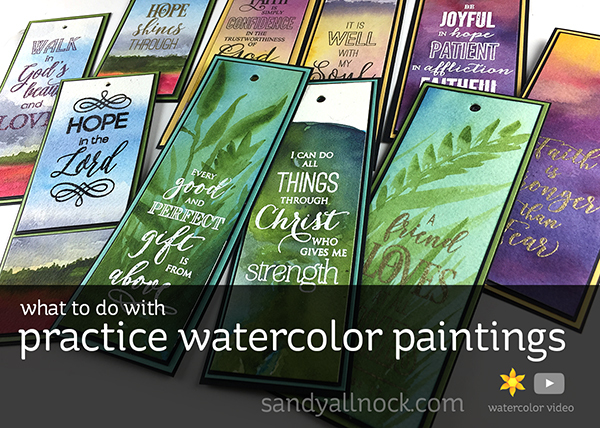 I made a bunch of bookmarks that can be used for a fundraiser at church…with nice heavy layers of paper, they can charge a decent amount for them too – just add ribbons before the sale! What a fabulous idea and your bookmarks are gorgeous! Thanks for the great idea and inspiration. Thank you for the great idea Sandy!!! It will help me to not feel guilty using Arches paper so much! I have to admit to being shocked and curious when I saw you put your paper in the bowl of water! What great fun to experiment!! Always looking for ideas to repurpose my not so goods and bookmarks are a great way to do it. Thanks for sharing and the inspiration. Love your creativity. How can I buy the “Be Joyful” bookmark? What a lovely idea– thanks for giving permission to do more practicing that can end up being useful! I’m on a tight budget but have put these Penny Black sentiment stamps on my wish list. I have plenty of backgrounds in a box (watercolor, texture, stencils, etc) and think this would be a great project for seniors. Wow, something I will try. I have a lot of, “darn it that didn’t end up the way I wanted” pieces so now I know what to do with those!! Would be great for friends to top off a gift. Water color is intimidating to me so I put off doing it. But this, I might be able to do!! thank you! Did you hear my scream when you dunked that gorgeous bookmark in water?! lol! They came out great, Sandy! Great idea. I’m glad to see you can add color to get more contrast. I love, love this idea. Turning something that’s a throw away into a small gift is wonderful. I work for a library and create bookmarks from time to time to give to our patrons. This idea is so simple, yet effective. Awesome idea. Your wisdom never runs short.